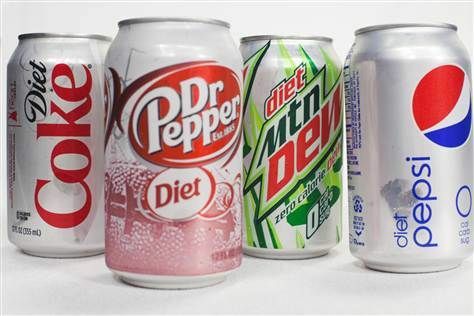 Diet sodas are linked to expanding waistlines, not slimming ""
Diet sodas are drinks made without real sugar. They are made with artificial sweeteners. It may be “no calorie” or have low calories. Either way, a sugar-free drink does not help you slim down. You may have completely switched to diet soda from regular, assuming it does not harm your waistline. If you think diet soda helps your health, then you need to know some facts. Some studies suggest that consuming diet soda compared to the regular version of sodas can make you overweight. The most commonly used sweetener is aspartame. It is used in diet Coke and also diet Pepsi. The other type of sweetener is saccharin, which is added to juices to make the drink sugar-free. Since aspartame gives a slightly bitter aftertaste, it is often blended with acesulfame k. Cyclamate is another type of sweetener used in liquid drinks. And lastly, sucralose is another sweetener, which is found in Splenda. This is how diet soda causes weight gain. Artificial sweeteners used in the production of diet sodas are refined and altered and they all taste sweeter than table sugar, but containing less or no calories. Consuming food that is riddled with any of these sweeteners can have an opposite effect on your weight loss program. There have been many serious studies conducted in the 1980s. In one study, the researchers tracked more than 3500 people for 8 years and found substantial evidence that those who drank soda with artificial sweeteners always had a higher body mass index. Studies have shown consuming drinks with artificial sweeteners can make you more addicted to sweet things. Human appetite is enhanced with a sweet taste and, so after consuming a diet soda, your body craves more sweets and the more you tend to consume. © Copyright 2019 What You Doing Now. All Rights Reserved.